- Data that will be used to generate a digital topographic map of 80 percent of Earth's land surface (everything between 60 degrees north and 56 degrees south latitude), with data points spaced every 1 arcsecond of latitude and longitude (approximately 30 meters). The absolute horizontal and vertical accuracy will be 20 meters and 16 meters, respectively. - Data sufficient to produce a rectified, terrain-corrected, C-band (5.6 centimeters wavelength) radar image mosaic of 80 percent of Earth's land surface at 30-meter resolution. - A 60-meter-long, deployable mast derived from space station designs. - Additional C-band and X-band antennas located at the end of the mast. - Avionics for attitude and orbit determination. The system will be launched in a stowed, compact configuration. When the shuttle reaches orbit, the mast will deploy, creating a 60-meter-baseline, fixed-length interferometer at both C-band and X-band frequencies. The X-band interferometer will be supplied by the German and Italian space agencies. SRTM will acquire data with 225-kilometer swaths during the 11-day shuttle flight, imaging all of Earth's land surface between 60 degrees north and 56 degrees south latitude. The data will then be processed into a digital topographic map. Data processing will require one year. The resulting digital topographic map will form a homogeneous data set referenced to a uniform global geodetic datum. Data formats will be compatible with standard software and terrain analysis programs, tailored to the needs of the civil, military, and scientific user communities. 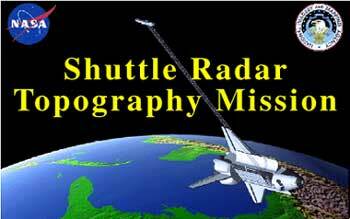 The Shuttle Radar Topography Mission is managed by the Jet Propulsion Laboratory, California Institute of Technology, for NASA's Office of Earth Science. During their 1994 flights, SIR-C and X-SAR successfully demonstrated interferometric topography mapping. (Left) A standard topographic contour map, derived from SIR-C interferometer data, of Long Valley in the California Sierra Nevada. (Above) A visualization generated from the same data set showing Crowley Lake in the foreground.